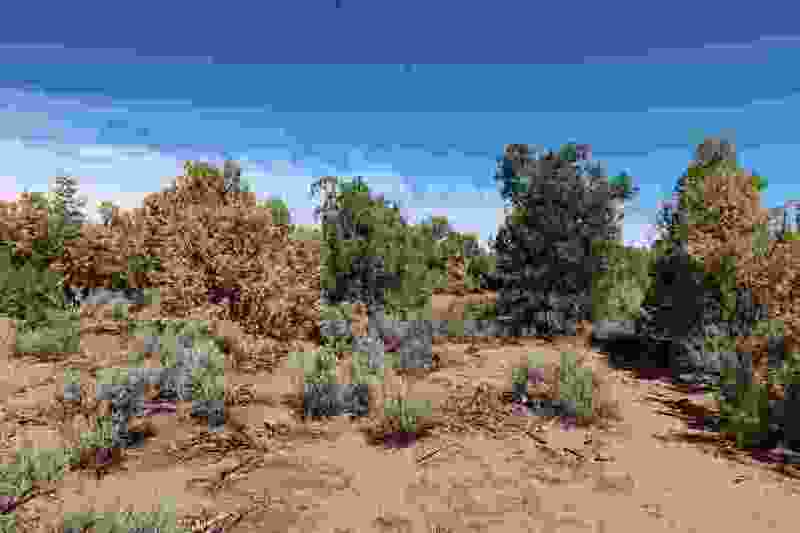 (Courtesy photo | Kate Magargal, University of Utah) Scientists and federal land managers are scrambling to investigate widespread juniper mortality in southeast Utah. Researchers shot this photo last month on Cedar Mesa, where junipers started dying in droves in September after the driest and warmest year on record. Foresters are stumped because juniper is seen as a drought-tolerant species. He frequents the Moki Dugway on the southern tip of Cedar Mesa, which provides photogenic views of the buttes and canyons falling toward the San Juan River in what was initially part of Bears Ears National Monument. Shumway has since documented dying juniper in other parts of San Juan County, which is in the midst of a severe drought. Shumway has shared his photos and drone footage with academic scientists and forestry officials, who are now scrambling to determine the extent and causes of Utah’s latest round of tree mortality. The Colorado Plateau just experienced its driest year on record. Bluff saw barely 2 inches of precipitation in the water year that ended Sept. 30, about a fourth of normal, according to a National Weather Service database. But juniper should be able handle a dry year. Other factors, working in combination with climate change, are probably at play, according to Hebertson, who works with the U.S. Forest Service’s Forest Health Protection program in Ogden. Like what is the extent of the mortality? What are the elevation profiles, soil conditions and other environmental characteristics of the affected areas? Are there signs of beetle infestation? Is the wood discolored? Are other tree species showing signs of distress? Utah is no stranger to conifer die-offs. Dixie National Forest outside Cedar City is ground zero in a beetle epidemic that wiped out spruce, while lodgepole pines are falling victim to beetles in the Uinta Mountains. Ghost forests stretch across basins and plateaus for miles around the West. Hebertson and her colleagues have been preoccupied this year with a new infestation afflicting forests in northern Utah, where a nonnative beetle, the balsam woolly adelgid, is decimating subalpine fir. This tree mortality is just as troubling as the one unfolding in San Juan County. In search of clues in the juniper deaths, Hebertson is leading numerous scientists on a tour near Blanding later this month, along with Shumway, who wishes the group came earlier while the yellowed foliage was still hanging from the juniper branches. Since retiring from CEU (now part of Utah State University), where he served as dean of instruction after helping to establish the Blanding campus in 1977, Shumway has explored Bears Ears country with cameras in tow. While stressed junipers have been documented across the state line in Colorado since last year, Shumway was the first to systematically record the phenomenon in Utah. Almost more a shrub than a tree, Utah junipers crowd valley bottoms and mesa tops all over the Beehive State. They often mistakenly were called cedars in pioneer times; hence the appearance of the word “cedar” in so many Utah place names. Junipers, along with the pinyons they usually grow with, are the subject of vegetation-removal operations in the name of habitat improvement. But these trees play a vital ecological role, stitching landscapes together and providing habitat for countless animals. Widespread loss of junipers would have far-reaching consequences for southern Utah’s fragile desert environments. Among those taking a keen interest is University of Utah biology professor Bill Anderegg, who studies the impact of climate change on forest ecosystems. A possible factor is the Western cedar borer or cedar bark beetle, insects known to attack juniper. Shumway has pulled bark off dead trees to find larvae munching on the phloem, the critical tree tissues that conduct the fruits of photosynthesis to the root system. But the presence of beetle larvae is just a clue, not a complete causal picture. Last year was not only the driest on record for Utah, but it also was the second warmest. Could warm weather be compromising the trees’ health, undermining their ability to repel beetle attacks? Or could it be enabling populations of hungry beetles to explode? Anderegg has applied for a Forest Service grant to explore such questions. At this stage, however, the extent of juniper mortality has yet to be established, much less why it might be happening, although few doubt climate change is playing some role.